Team Highlands has been working on improving the quality of our school pond. Power Plants is a project that has been accomplished by team Highlands. We constructed the floating islands to help reduce the pollution in our school pond. Some of the positive qualities that this has had on our pond includes helping to reduce pollution, they also help to reduce the effects of runoff from fertilizer, they help to further increase biodiversity around our pond and reduce phosphorus levels. Phosphorus is a nutrient that plants need to grow, this property influences the growth in algae. This can also influence the quality of the water. These examples are just some of the positive effects of the floating islands in our school pond. Pollution is a growing issue throughout our lakes. This is influenced by various things, some of them include runoff, people putting trash into lakes, or septic systems/animal waste making it into the water. These are common ways that our environment becomes polluted. Power Plants will help by acting as a filter for the water, which helps reduce pollution, and phosphorus levels. Phosphorus has positive and negative effects in our pond. Power Plants is a project that will work towards lowering pollution levels. The floating islands don’t just look great, they’re good for the environment as well! Power Plants helps to reduce pollution throughout the water using an eco-friendly technique. The plants found on the island help to reduce the pollution by taking in some of the negative factors out of the water, and into their roots. This is beneficial to our school pond because of the location it is in and the purpose of which it was made for. Our school pond is located near the soccer fields and near a parking lot. Making it a target for runoff from sources such as rainwater, fertilizer, and residue from the parking lot. Biodiversity is another positive effect the Floating islands have on the pond. This is an important quality because biodiversity can also help to reduce pollution and attract pollinators. Biodiversity around our pond can also help reduce pollution. The roots of the plants on the floating islands, and around the pond help to reduce pollution by acting as a sponge or filter in the water. Phosphorus is another factor of pollution. By helping to reduce the pollution, they are also contributing to bringing down the phosphorus levels. These effects help to improve the environment around our school pond. These are just some of the ways that Power Plants will take a step towards decreasing pollution. 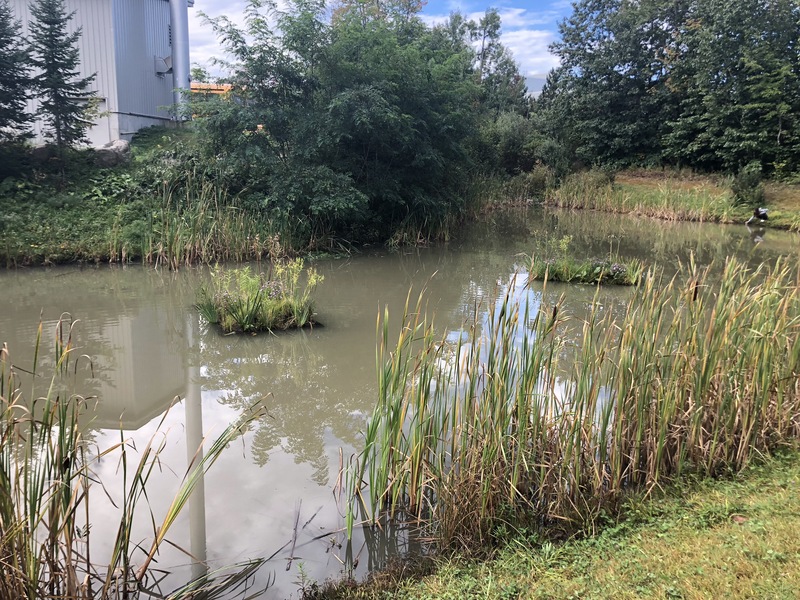 From reducing pollution and increasing biodiversity to having a natural approach to helping our environment, Power Plants has had only positive effects on our school pond. By researching this issue we believe that by inserting floating islands into polluted bodies of water, that it will show some of the same effects on the polluted water. Our hope is Power Plants only continues to grow and become a more common possibility to improve the quality of our lakes.